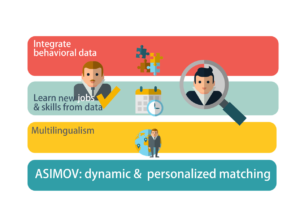 Asimov was a large scale research project that was done by Actonomy, Crosslang, De Persgroep in collaboration with iMEC (IDlab) and KUL on how machine learning could be used to generate automatically ontologies in a multilingual environment. In addition it also studied the usage of user behavior to enhance the matching results. This has now lead to a new generation of matching focussing on better quality results and development at a much lower cost.